outdoor living environments for over 35 years. Our professionally designed swimming pools compliment many other features of the backyard that we can help develop your home into an oasis of refuge from the hurried pace of today’s life. We custom build each and every one of our pools for our clients’ unique needs, from the tile on the steps, to the plaster surfaces of the pool’s interior. Product selections can include many varieties of surfaces including standard white plaster, light, medium and dark Tahoe blue, Pebble Tec, Pebble Sheen, Diamond Bright, River Roc and more…. Hours of work and many calculations go into bringing an unparalleled environment to share with your friends and family. Our new or remodeled Roseville swimming pool designs are safe, environmentally friendly, functional, powerful, and above all, beautiful. ePoolscapes.com is the premiere pool company for our area that has been continually involved in every aspect of swimming pool construction. Plaster surfaces for in ground swimming pools require a customer orientation for both the choices and the realization of a swimming pool design. Let us mock you up a new pool concept idea for you today! Fill out the contact form on the right-hand side and we’ll be right back in touch with you. While you may not have a broken pool, we assist clients through the Roseville pool remodeling process. We sit down and assess what your swimming pool is currently going through, and elevate your understanding for all of the right steps that will be necessary to get it to where you want it to be. Our full spectrum swimming pool remodeling services provide our clients with a clear view of our capabilities. These attributes are often recognized as the crucial difference between us and the competition for what brings that deeper layers of quality and professionalism to our clients’ backyards. For example, new plaster may involve a new pool cleaner device, we could install one of many energy efficient swimming pool cleaners that will automatically keep your pool clean and provide longevity to the plaster or pebble surface. At ePoolscapes.com we work with you to build, design and execute your new or remodeled swimming pool plans. 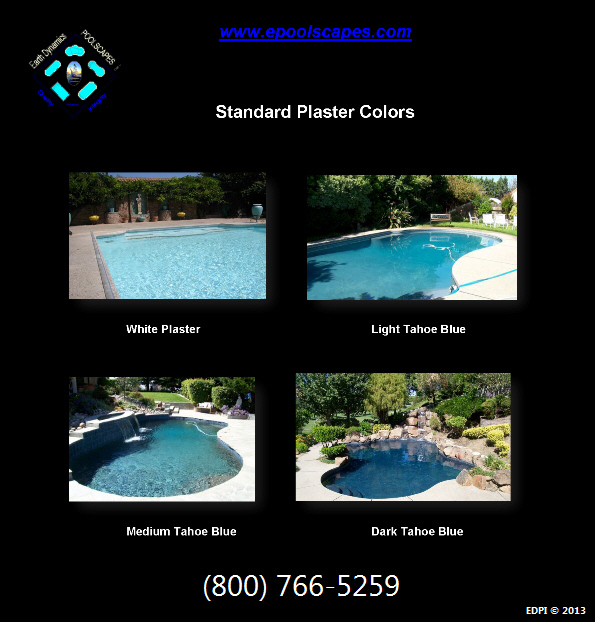 swimming pool landscaper, contractor, designer and builder performing in the five-county area (Yolo, Sutter, Roseville, Placer and Nevada counties). We are family owned, locally operated with in-house capacity performers providing complete swimming pool remodeling projects, new swimming pool construction and complete landscape construction compliments. Often, Roseville swimming pool construction requires a swimming pool builder to express greater depth for the possibilities involving swimming pool design and swimming pool equipment specifications. It can also involve complete landscape architectural design for creating the ultimate outdoor living environment.